Just after her parent’s 25th wedding anniversary, Luisa (Rosa’s niece) was diagnosed with a form of Down syndrome. Days after that, Mayan Family’s Dr. Luis de Pena recommended physical therapy for the two year old. On our way to Fundabiem for her fifth weekly session Maria told me that her daughter seems to enjoy the training. But, the little one seemed barely able to endure five minutes of having her gnarly feet and legs massaged. She grew furious, tried wriggling away; started shrieking in frustration. Tears really rolled when she was set – belly down -over a large bolster. In fact, the poor kid had been howling purple for fifteen minutes when the therapist at last took a small towel and wiped sweat from her tiny face. Luisa had raged on majestically until the session’s end and when her workout was over she took the breast and nuzzled her head deep into her blanket. 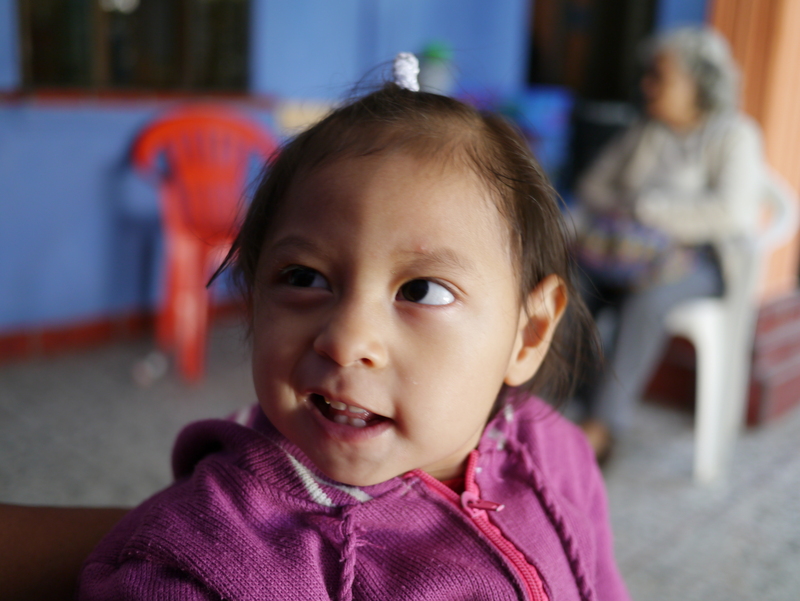 Before we left, the therapist told Maria that that Luisa needs an appointment to have orthopedic shoes made. Otherwise the child’s feet will curl like ferns. This means Maria will need to travel two hours up to Xela for the fitting. 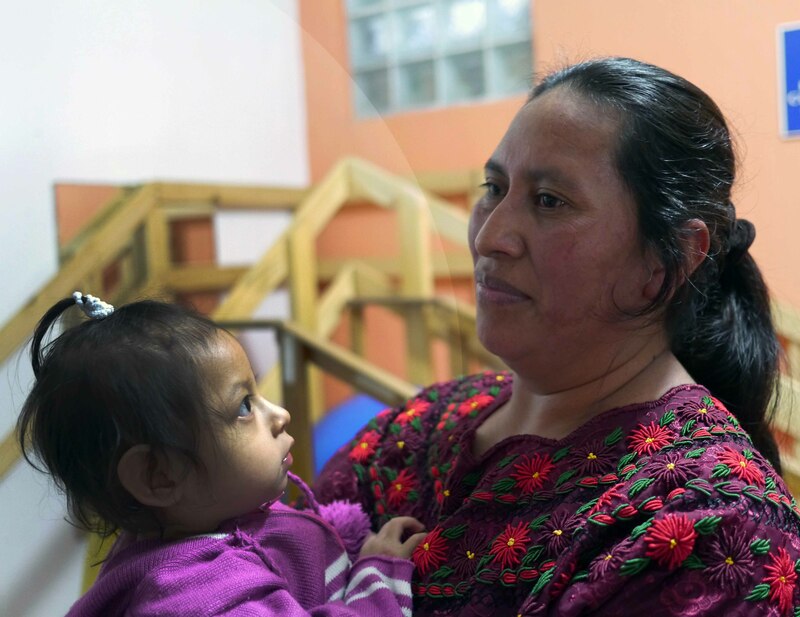 The receptionist, then, reminded Maria that next Friday Luisa will see the neurologist in Solola for her first assessment. In a country that has laws about treatment for the handicapped but scarce resources to fund its own programs these NGO’s are providing brilliant service. Children like Luisa often live their whole lives as shut-ins. But, Luisa is fortunate to have a large supportive family to keep her stimulated and well cared for. This is exceptionally good because it is beginning to look like Luisa will continue to require medical services and care. Luisa needs help with protein suppliments and other expenses, But that’s a budget. Panajachel has always been “very familiar” and not just because the T-shirts herald familiar places like Sturgis, Beverly Hills or Ramapo College. When the Californians remarked that it feels like Avalon Bay all my déjà vu made sense. I instantly snapped to feral summers on Catalina Island. Freed from L.A. traffic and smog at last. (If you don’t know the island “26 miles across the sea,” the closest approximation is that seaside burg in Fellini’s Amacord where ingrown townies mix it up with seasonal tourists. And, it seems that I have been here quite awhile– at least long enough to see one injured daddy, who once had to awkwardly secure his daughter with his good arm and steer his bike along the cobblestones with his casted arm, shed both the sling and the plaster. I have also learned how to avoid the vendor/beggars by taking a longer parallel route. More important, I can pretty much tell the “X” laden Mayan dialects from Spanish and know who’s from where by their colors. For instance, a couple of weeks ago, the clamoring sea of blue (Santa Catarina Palpolo) vendors were permuted by a feint tide of diffident maroon clad vendors from Solola. And, this desperate inundation came just weeks before the big announcement about the main road closing two months for repairs. While this closure will probably be a slight inconvenience for resident gringas, it is about to be devastating for this region to be so isolated during tourist season. So, overnight the watch (out) word has become “prestar.” Like: Recently, my landlord slithered to my door and requested that I prestar 100Q to him to help him buy some remedy for an (allegedly) ailing member of our compound. About a day later, my friend, the jewelry designer, wanted a prestar 500Q to cover her gas and lodging while she went on a selling trip to another department. And, yesterday, whilst I wended down from Barrio Norte my favorite tamale lady flagged me down and asked if I would prestar her some Q’s These are signs of the (not so good) times to come. I much prefer the word when it is used as in Shakespeare: “Friends, Romans countrymen prestar me your ears.” But, I get that things are dicey around here, when the friendly vendor, who has her space by the pizza stand asserted that the night was peligroso and that I should be on my guard. Meanwhile, I have discovered among the NGO’s it is always poaching season. I helped put together the finance section of a proposal for a summer school environmental course benefiting two towns along the lake and was urged to take the meeting on it. The young teachers, who were to get work if the deal got funding, were going to present it at an agency. Before they set out, they were warned not to provide the full documentation they carried but rather to offer only the light abstract. We had just sat down when our hosts distained their synopsis and requested a copy of the bigger document. Evidently, if the young people had not been so been forewarned, the project and their jobs would have been snatched from their hands by the “friendly” agency. I am so happy in my new space that I was a bit nervous about not returning home from the Capital. Still, I made out a shopping list for medicines, paints, food and clothes and rode in with Alison. Her mission was to wrestle with the government on car registration and temporary residence permits for her family. This irritating odyssey dented her visit. But, happily we were able to find “Chinatown” — one big warehouse with tea, incense, woks and dragonsuits. On the way there, we found a railroad museum located in an old train station and adjacent to that, an exhibit that she was searching for called “Porque estamos como estamos.” This was a world class show that was too much to take in in one visit. It covered the prehistory of the Mayans through the Civil War. There were maps showing the southern migration of the Mayans from Mexico and clearly illustrated the rise of and differences among their 22 dialects. There were tapestries showing the arrival of the Spanish and the invaders’ use of northern tribes to subdue the Mayans. 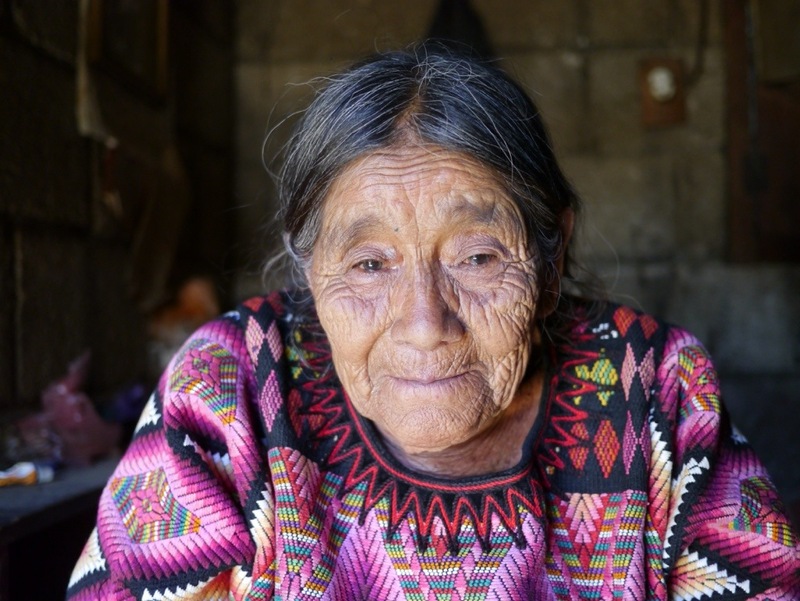 It was so rich in multimedia and full of artfully displayed demographics that we did not get through the more recent histories of how the Cold War was played out in Guatemala, i.e. U.S. interests vs the Church (backed by the Russians.) Nonetheless we luxuriated in the city eating mediocre sushi and drinking damn good martinis.